Rudolph DigiPol 781 Digital Polarimeter Enantiomer Analysis DP781-38U . New Life Scientific, Inc. The Rudolph Digipol automated digital polarimeter powered on, the printer produces characters, and requests an arc lamp power supply. Unfortunately, NLS was unable to test this product and bypass the arc lamp power supply; the interface requests that it be plugged in to the additional power supply, before the screen will advance. 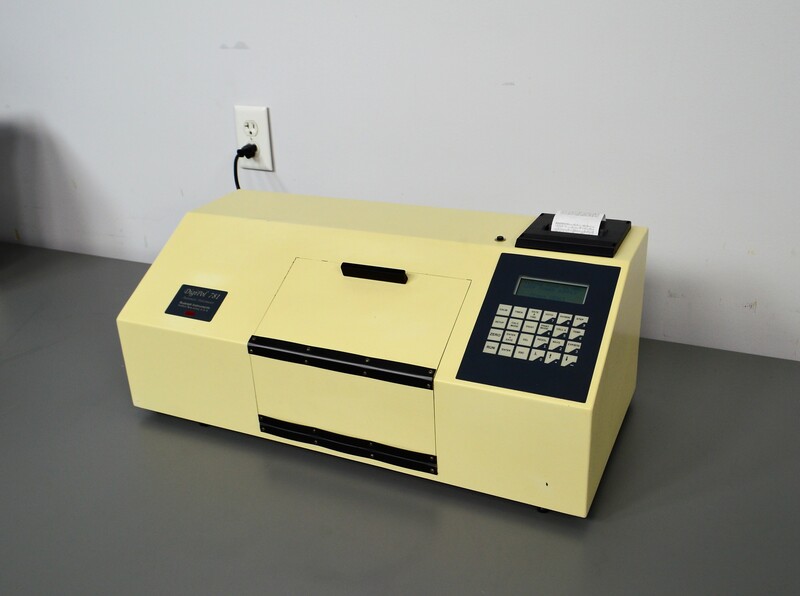 This polarimeter is in good cosmetic condition and there are no obvious blemishes. This product is ideal for a laboratory seeking a back-up polarimeter and/or to replace theirs. While New Life Scientific takes many steps to ensure that the instruments are in perfect working order, we cannot ensure that all products are up to manufacturer specifications. We recommend every product undergo professional installation and calibration before use in research, production, and clinical applications. For this reason, we offer a 30-day warranty for all working products in the interest of maximum customer satisfaction.